"Officially dubbed the Ghost Files now, Bronze Nazareth handles the production on the “Bronze Tape” while Agallah laces the “Propane Tape” — both of which hold the same tracklist as the original with features from Raekwon, Snoop Dogg, KXNG Crooked, Benny the Butcher, Bishop Lamont, and others." - 2DBZ. You can stream both the Bronze Tape & Propane Tape below. This EP is a kind of juxtaposition between what we want to hear and what we need to hear. The song “Furnace,” Ft. Fashawn and The Last Artful, Dodgr is just a fun weed song to help give us a smoke break from the state of the world, however the B side is quite the opposite. “If You’re Down,” ft. Blu and Cashus King is very much a discussion about the ills of this world, but also a call for unity of all races and religious beliefs to stand up for humanity and social justice. The 100th episode of Peter Agoston's House List podcast: "I wanted to do something extra special for the heads on this one - so who better than DOOM. Culled from a handful of conversations recorded onto cassette, MF DOOM and I discuss the then unreleased and to me, unheard, 'MM FOOD' album. 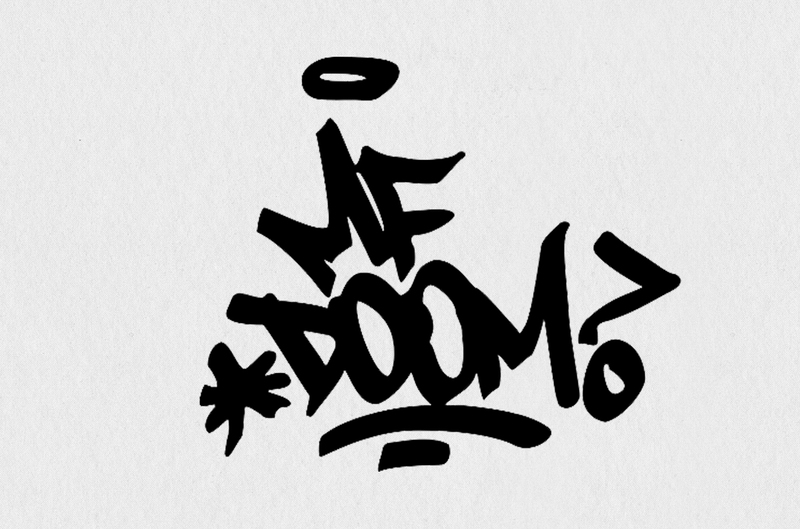 This was originally recorded in May 2003 for an expansive cover-story I wrote on DOOM for Elemental Magazine. After listening to these again, there is no doubt in my mind how talented, intuitive and inventive DOOM is. 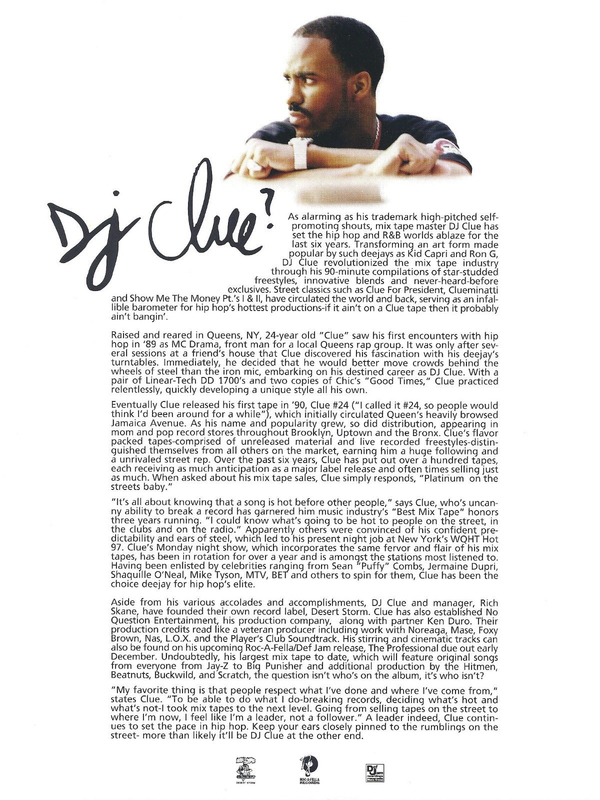 It of course goes without saying, but I do feel like these chats I had with him shed much more light on how he willed some of the best hip-hop music of the last 20 years out of sheer desire to create, if even sometimes under a state of duress. A master collage-artist, poet, author, satirist, DJ, producer, performer. I truly hope this episode (like them all) will serve as a living document to his great accomplishments in music and art. I am appreciative of the time we had recording these and the few musical collaborations we did some 20 years ago now.Thank you to all the listeners as this is fully listener supported." Listen to it below. Hosted by veteran DJ Toast and broadcasted live every Sunday night 10pm-12 midnight (ET) from 91.5 WRPI (Albany NY), Toast brings you 2 hours of the best in vintage & contemporary true school Hip Hop. This is a 2-part series, Episodes 190 & 191: Class of 1993 Reunion - DJ Toast dives in quick with tracks from Super Cat, Poor Righteous Teachers, Jeru The Damaja, Diamond D, Pete Rock & CL Smooth, Fat Joe, Digable Planets, The Beatnuts, Ice Cube, Kurious, Shyheim, Onyx, Trends of Culture, M.O.P., Big Daddy Kane, Wu-Tang Clan, Tha Alkaholiks, De La Soul, Cypress Hill, Dred Scott, Lords of the Underground & so so much more all the way through to the second episode (191) below. All classics, in my eyes. You don't want to miss this one, listen below! "To honor the life and art of the late DJ Devastate, Coalmine Records is proud to team up with the Swedish artist’s native label, Counterweight Records, on this very special Record Store Day 2018/Black Friday release. 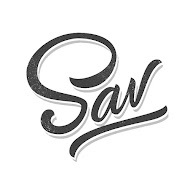 The Swedish-born DJ and producer passed away at the young age of 35 years old in March 2018 and left a huge whole in the hearts of his friends, his family, and his fans. If there’s any consolation, it’s that we have his incredible art left with us to remember him by, and we and Counterweight couldn’t be more excited to share this eight-track vinyl release that showcases his immense skill set. On the Coalmine side, you’ll find five of our favorite tracks featuring the talents of Devastate... Counterweight’s side is equally as fly... There’s just so much to love about what you hear on this release, which truly exemplifies just why we so deeply miss our friend DJ Devastate. He was a soulful, gifted, and inspired artist and man, and we’re glad his spirit lives on through his music." R.I.P. 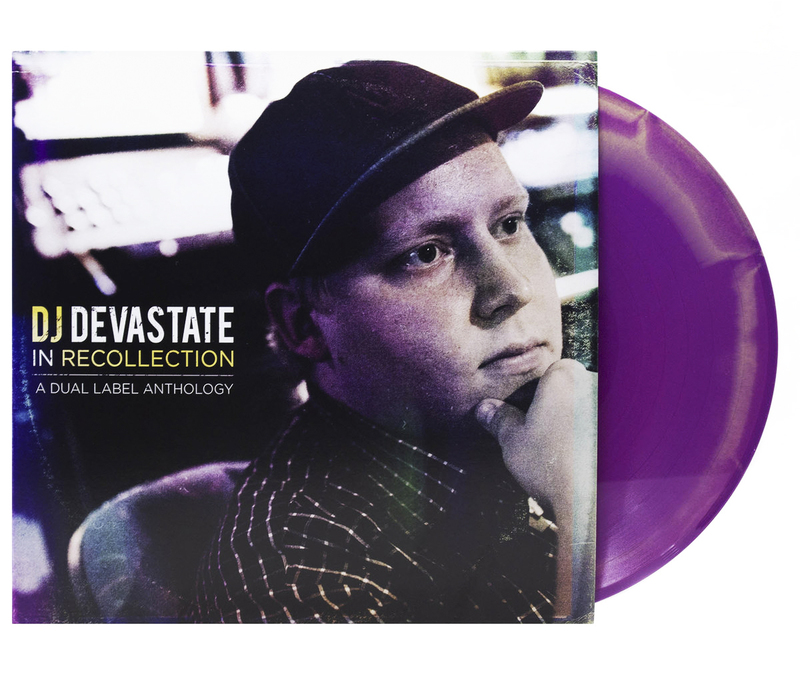 DJ Devastate. 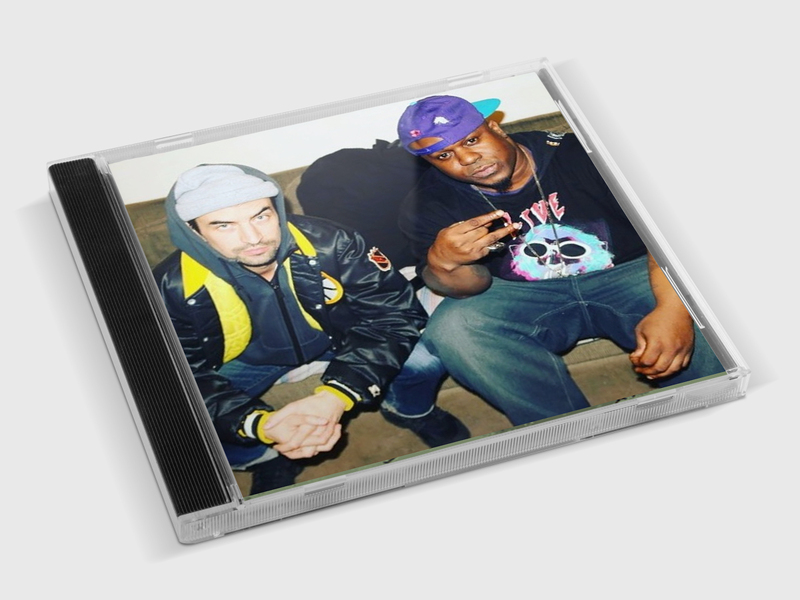 Listen to this excellent tribute EP below and cop the vinyl. 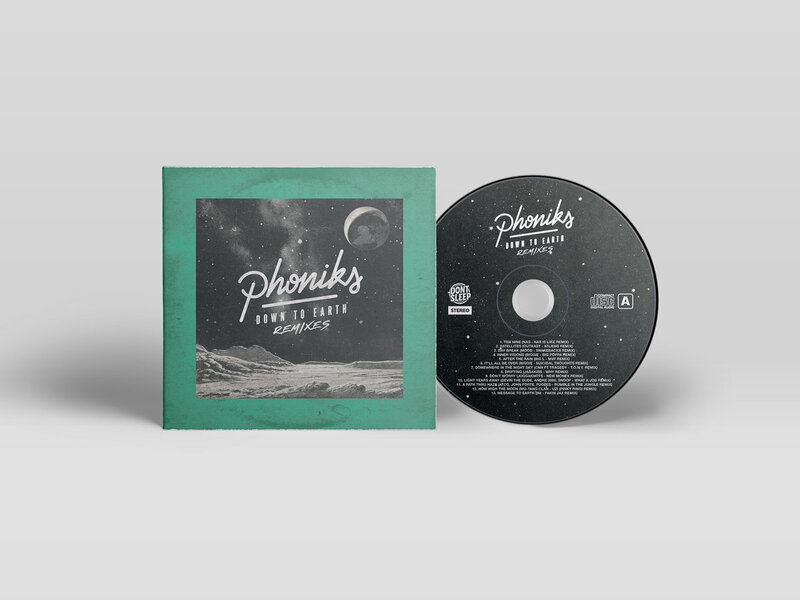 A remixed version of Phoniks' first full-length solo project. Originally 2 years in the works, Phoniks dug through over 250 hours worth of recorded material when piecing together his solo debut. 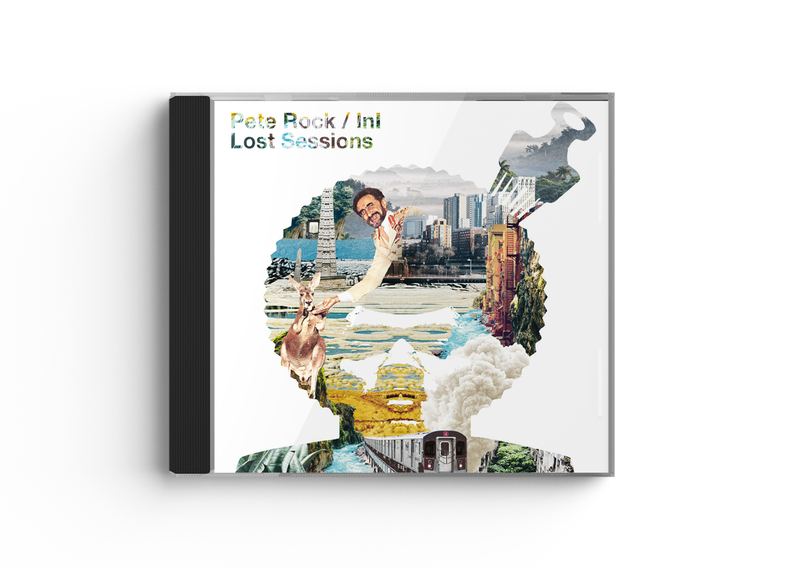 The album was comprised of jazz-tinged lo-fi head nodders with crunchy 12-bit drums, spaced-out filters, and delays + a sprinkling of horn loops and soul vocals. The remixed version of "Down To Earth" utilizes records from Nas, Mood, Outkast, Big L, Biggie, Capone-N-Noreaga, Jadakiss, Wu-Tang & more, to further help bring these instrumentals to life. Stream/Download it below. "A continuation of Benny’s Tana Talk series. Tana is short for Montana Ave, the street Benny lived on in the Eastside of Buffalo. This album serves as a platform for Benny to showcase his gritty, yet honest and heartfelt storytelling. 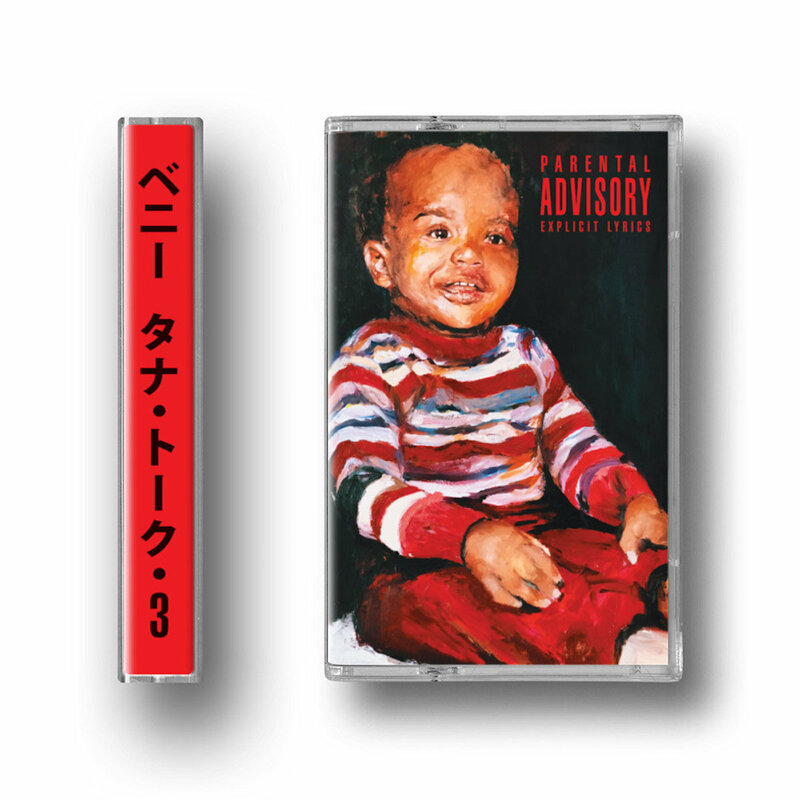 The cover is a painting of an old baby photo of his deceased older bother, MachineGun Black (Rest In Peace)." - via Genius. Stream it below. 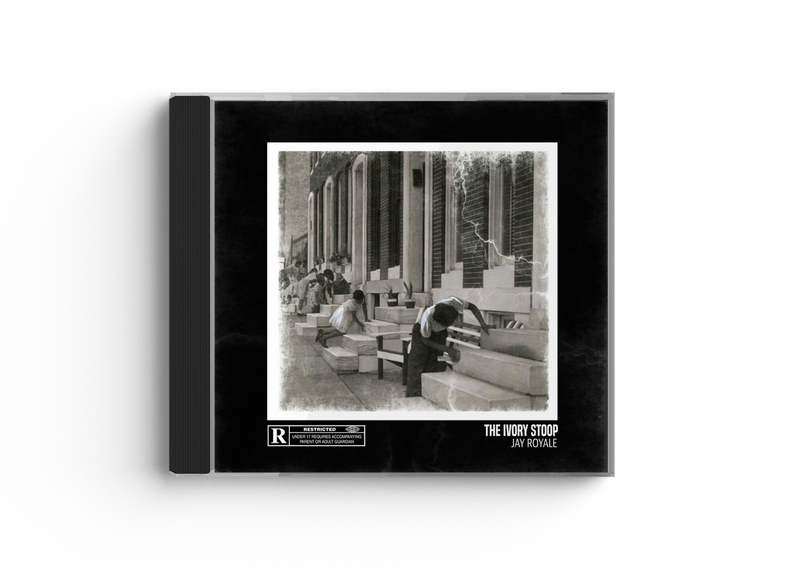 Jay Royale, the East Baltimore emcee delivers his debut LP, The Ivory Stoop, full of crafty lyrics over minimalist, boombap production. 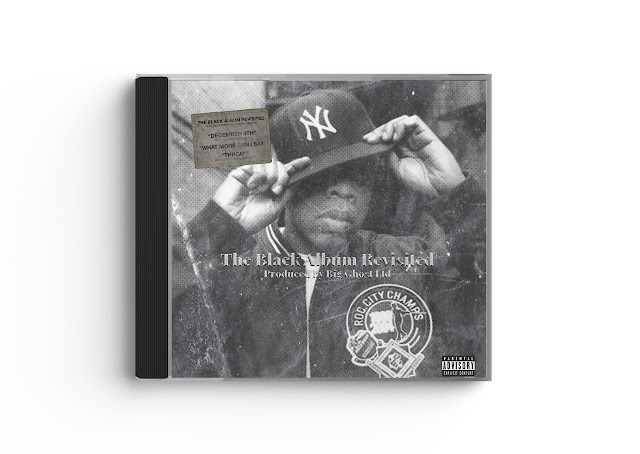 He features some of the finest MCs in the underground on the project, enlisting Ill Conscious, Benny The Butcher, Conway The Machine, Westside Gunn & more. The dusty beats & minimal loops maintain the feel of the peak-era sound from the early/mid 90’s. If you're unfamiliar with Jay Royale, then the features should tip you off as to what to expect, do give it a listen and trust it's on par with some of the best releases from the underground. 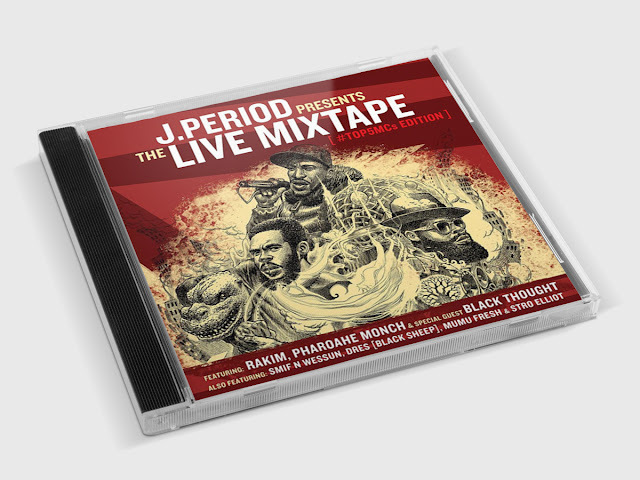 "J.PERIOD’s Live Mixtape is a first-of-its-kind Hip Hop mixtape, performed and recorded live onstage—in one take—by some of Hip Hop’s most celebrated MCs, and one of its most groundbreaking DJs. Recorded LIVE in New York City, The Live Mixtape [#Top5MCs Edition] features three legendary MCs—Rakim, Pharoahe Monch & Black Thought of The Roots—in an epic display of microphone mastery, seamlessly mixed by J.PERIOD, and re-igniting the timeless Hip Hop debate: Who’s your Top 5 MCs? 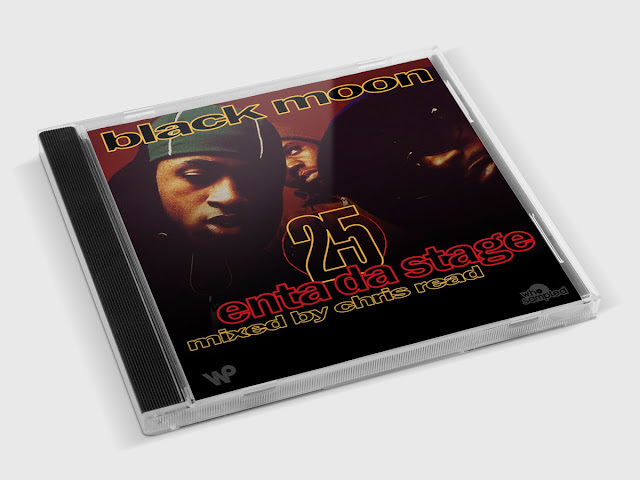 Guest appearances include: Smif N Wessun, Black Sheep, Stro Elliot and Mumu Fresh." 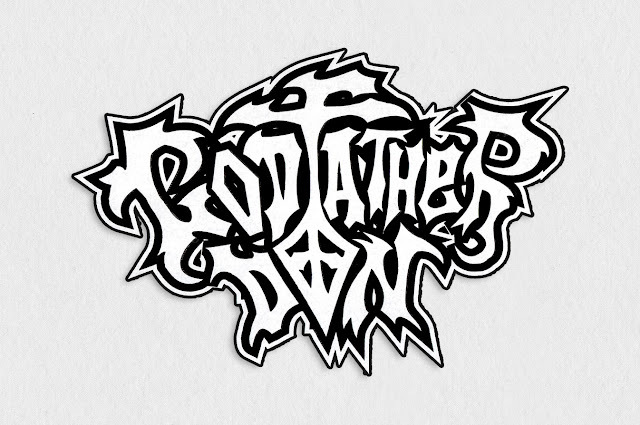 Godfather Don is the latest guest on the House List Podcast - hosted by Peter Agoston. "In what marks his first real, long-form interview - Godfather Don is extremely cool, affable and open. And that was mostly talking about music (we hoped and plan to get a more esoteric, next time)! He has been a personal favorite of mine for a long time. A lifetime resident of Brooklyn, we discuss it all. Picking up a guitar as a small child, to making beat-tapes with a guitar pedal. 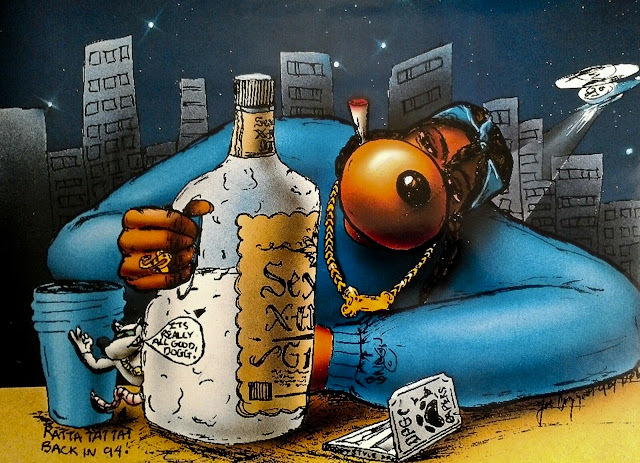 Many where introduced to Don's seminal work on Ultramagnetic MC's 'Four Horsemen' (Wild Pitch 1993) album, others with his actual debut 'Hazardous' (Select 1991). He had a prolific run doing the indie/underground boom between labels Fondle Em and Hydra, which resonates widely to this day (seen in the many limited reissues of his work). Yet all the while, Don has seemingly been shrouded in mystery. Now, Don is a actively performing Tenor Sax player around BK. He's recorded a new Jazz project, I saw him play - he's amazing. It's a fantastic transition into a different musical horizon. I highly suggest watching or listening, when you have the ability." Listen to the full interview below. 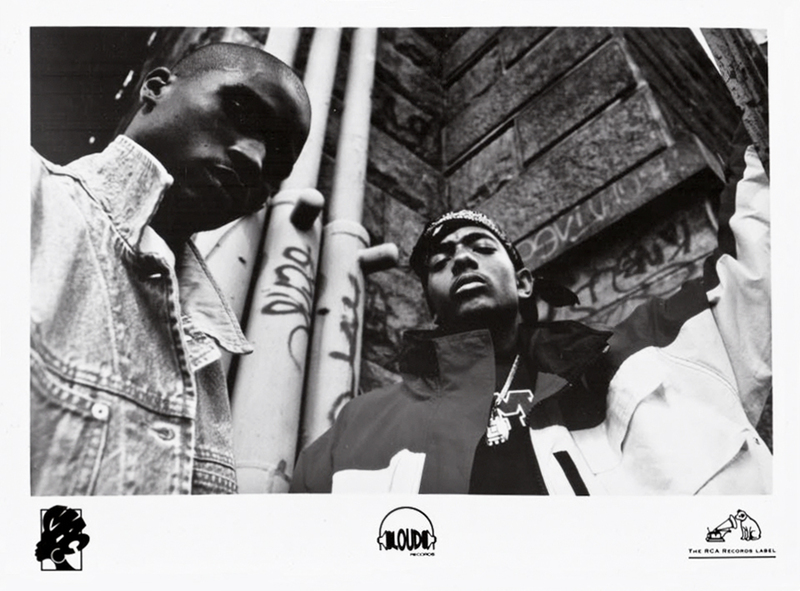 "After hitting gold with their last album, Mobb Deep is right back in it with the album "Hell On Earth." The act's street infamy is taken to the next level by the album's musical reflections on life and death, which spring largely out of mixed events: Havoc's reunion with his prison-released young brother, Prodigy become a father, and a horrible car crash that left two friends dead. The album title refers to the simple fact that violence in our culture isn't created from words on a CD or images on a screen, but rather is a grim reality that art can only reflect. The opening track, "Animal Instinct," testifies to the cut-throat competition in rap and denounces the genre's pervasive "thug" mentality. 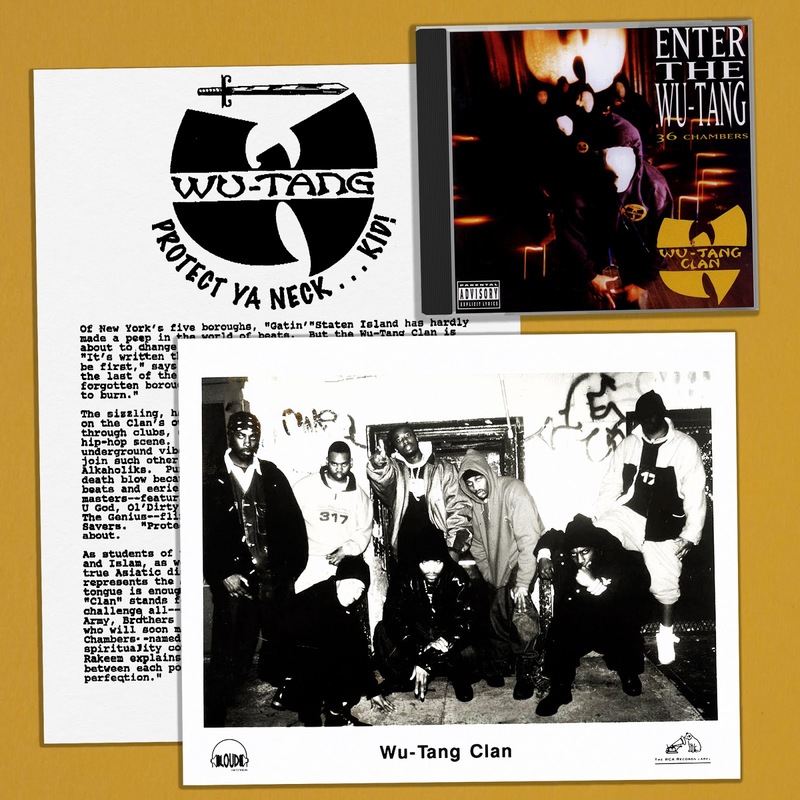 The set offers guest appearances by Nas, Rapper Noyd and Wu-Tang's Chef Raekwon and Method Man." - Billboard, November 15, 1997. 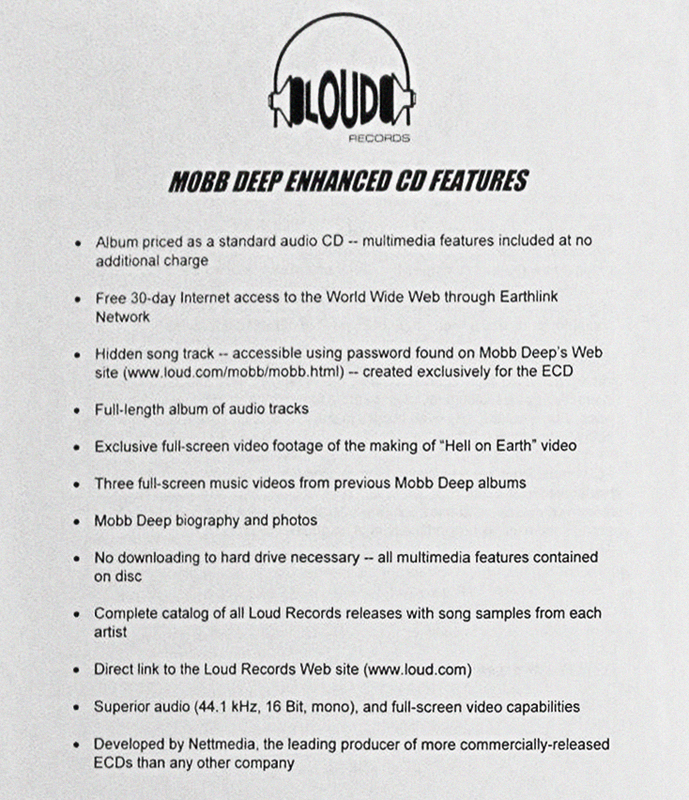 Below is a brief video running through some of the enhanced CD features that came with the album, and below that is the original press release for it. The press release regarding the enhanced CD features on "Hell On Earth" says that the enhanced CD is included at no additional cost. It included 30-day internet access, a hidden song (using a password), as well as the the full LP, exclusive video footage, bio and photos and access to snippets from other albums on Loud Records. I mostly remember the home-screen cycling over and over, but I was not computer savvy back in the winter of 1996 ... I almost forgot about these bonus features. The House List Podcast "Swigga aka L-Swift Episode"
"Swigga once known as L-Swift has a story to tell. We do a deep dive live from the NorthEast Bronx in this revealing true narrative of how a young kid from St. Lucia in the Caribbean transplanted to New York City. Certain heads will know his work closely from the lore of his group Natural Elements, one of the city's most talented yet mysteriously never getting their proper due or platform. For added reference please listen to Episode 33 of this show to hear our talk with Mr. Voodoo (Natural Elements). Shouts to Eddie Brock (also a collaborator with Swigga in their group Northeast Wildcats), whom allowed us to record this conversation at his crib. Enjoy! 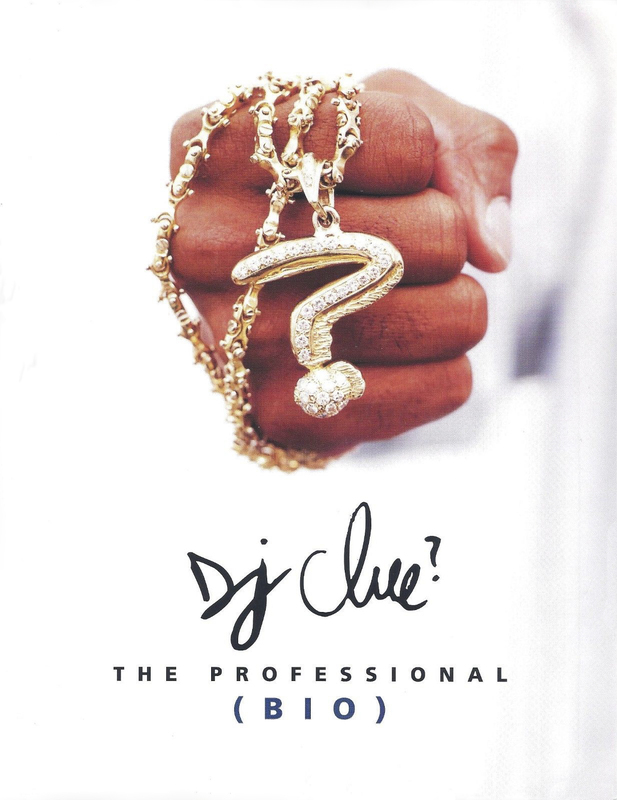 The intro song is entitled 'Check Da Style,' produced by Charlemagne and released on Fortress Entertainment in 1995." The House List podcast is hosted by Peter Agoston. Another great episode, check it out below. Certified Classics celebrates the 25th Anniversary of Enter the Wu-Tang (36 Chambers) with the release of For The Children: 25 Years of Enter the Wu-Tang (36 Chambers), a short film featuring members of Wu-Tang, family, and friends discussing the impact of the iconic album. Taking viewers on a tour through 36 Chambers, this film explores each song via untold stories from Wu-Tang Clan members, alongside personal reflections from many of today's biggest artists. Watch below. In 2018 we find hip-hop’s storied journeyman, Masta Ace, at the helm of another sharp, tightly wrought project. 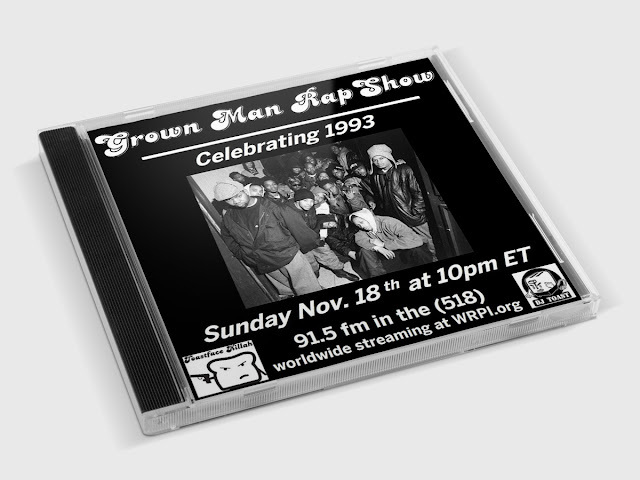 He’s traversed hip-hop’s ever-changing landscape for nearly three decades, navigating different eras while expanding his already extensive catalogue. Despite amassing 7 solo albums, 5 collaborative projects and countless additional one-offs, Ace is still trying to show and prove, still moving the needle forward for himself, his fans, and his career. Says Ace: “My goal on A Breukelen Story was to do more lyrical stuff. 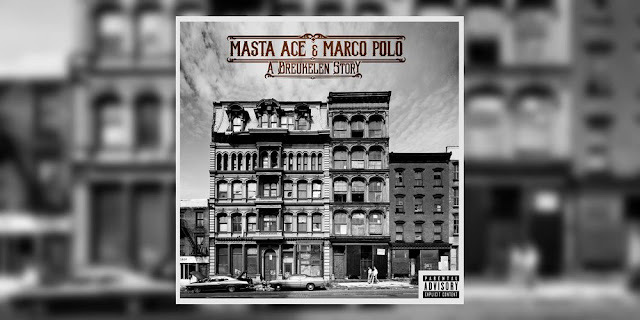 I’ve done a lot of concept songs, and a lot of topical records, but I made a point to put a couple straight rhyming joints on here to remind dudes I can still do this.” Marco Polo is not new to forming quality collabs with others in the art form, with notable stints on the Port Authority as well as it’s follow up, PA2, and others like 2016’s work with young MC, A-F-R-O, fittingly titled A-F-R-O Polo. Yet out of Polo’s previous collaborative efforts, this one stands out and is a bit more special, according to Polo: “Ace does not like to write random songs, its usually conceptual and topical,” he says. “But we do have some straight spitting joints on A Breukelen Story which is what makes this album possibly the most diverse of all of my collaborative albums.” The long-awaited collaborative release from Masta Ace & Marco Polo, "A Breukelen Story," is now available via Fat Beats Records! Take It Personal Podcast "Marco Polo & Masta Ace Episode"
"Episode 35 features Juice Crew legend Masta Ace and beat maker extraordinaire, Marco Polo. Their new album "A Breukelen Story" drops this Friday (11/9/18), but Take It Personal was lucky enough get the jump, so we have a handful of exclusives that can only be heard on this show! 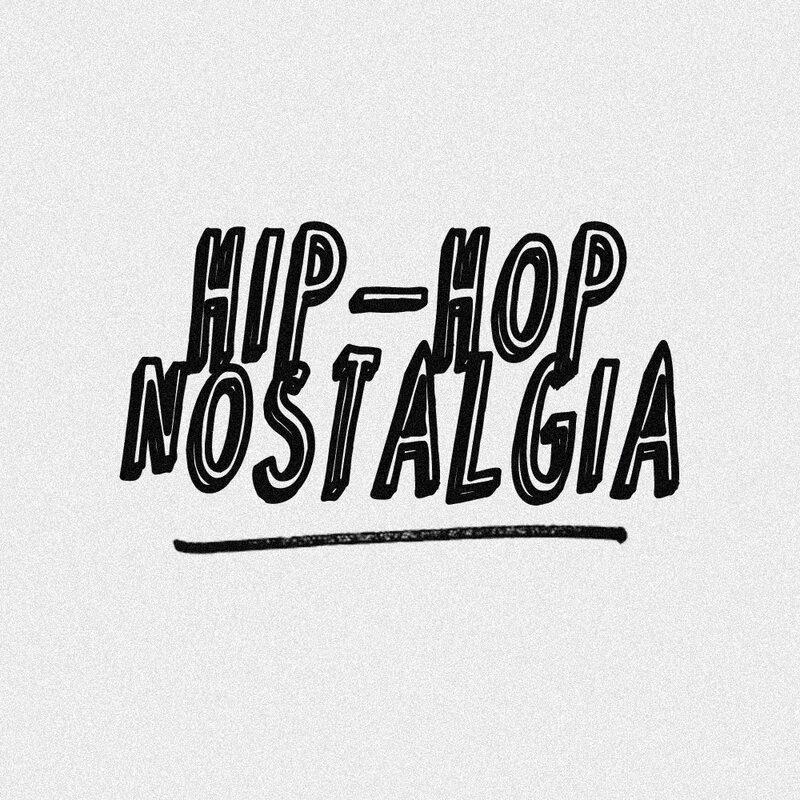 We also have new music from Pharoahe Monch, Action Bronson, DJ Muggs & Roc Marciano, Black Eyed Peas, O.C., Ghostface Killah and Apollo Brown & Joell Ortiz. 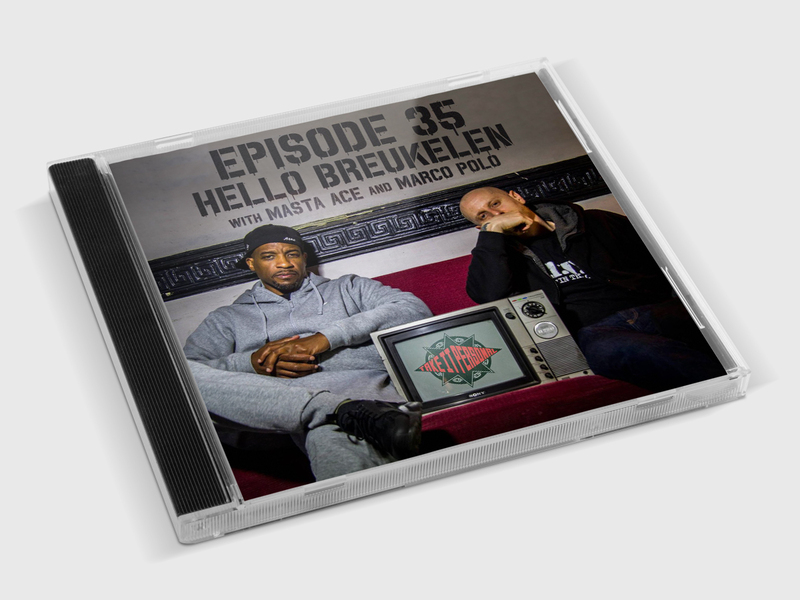 Peace to Masta & Marco, and please support "A Breukelen Story" when it drops!" Listen to the interview & lots of music below. Mixed by DJ Chris Read: “Released October 19th 1993, Black Moon’s classic debut LP ‘Enta Da Stage’ celebrates its 25th Anniversary this week. Produced entirely by Da Beatminerz, the album’s production style epitomises early 90s East Coast boom bap sonics with laid back, filtered jazz-funk samples meeting crunchy drums, cut choruses and gritty wordplay. In celebration of the anniversary we’ve teamed up once again with Wax Poetics magazine to present this exclusive mixtape pairing album tracks and remixes with their sample sources, interview snippets and more." 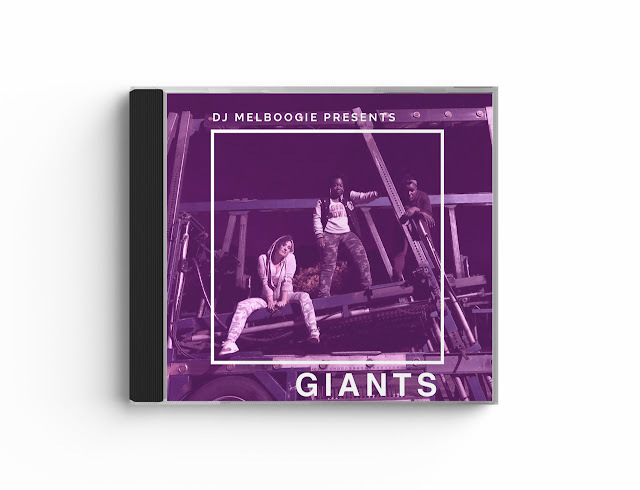 DJ Mel Boogie ft. Eternia "GIANTS" / "The L.I.F.E. Project"
This year marked DJ Mel Boogie's 25th anniversary in the Canadian music landscape, making her not only a veteran, but also a trailblazer. For the past two years, MelBoogie has been working on an album representative of some of the most talented rappers in Toronto, accumulating into her compilation album, DJ Mel Boogie Presents the L.I.F.E. Project. On the L.I.F.E. Project, Mel Boogie has enlisted just female lyricists to flesh out her album: Eternia and pHoenix Pagliacci go head-to-head in a bar-for-bar battle on "Giants," Rah Digga shines on the posse cut "Blazin'" and LolaBunz and Keysha Freshh paint the most vivid imagery on "You're All I Need." In addition, the album includes JellyTooFly, Haviah Almighty, Lex Leosis, Ashley Jenelle, and more for a total of 14 sharp tracks. 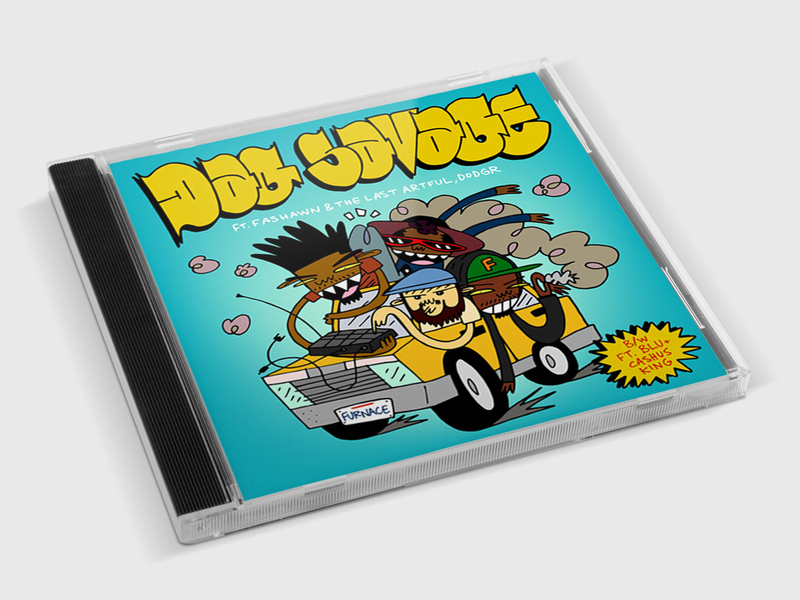 Producers who collaborated on this album include DJ Mercilless, Tone Mason, Big Sproxx, and more. Mel Boogie adds that she partnered with Sproxx to bring her project to fruition, which "has made me have even more respect for artists who pursue their passion while balancing work, school, children, and the day-to-day challenges of LIFE itself." Props to Exclaim for their review to include with this post, another integral part of the Canadian music scene. Salute Del F. Cowie & Erin Lowers. "Led by Saxophonist Rob Mitchell, Abstract Orchestra have been a consistent presence on the UK music scene, steadily building a loyal and supportive fanbase. The band itself is based on the classic jazz big band instrumentation of saxes, trumpets and trombones and features the cream of the north of England’s jazz scene. Abstract Orchestra’s Madvillain Vol 1. explores the jazz, TV soundtrack and film score aspect of the original work, combining it with classic big band writing and a focus on improvisation. 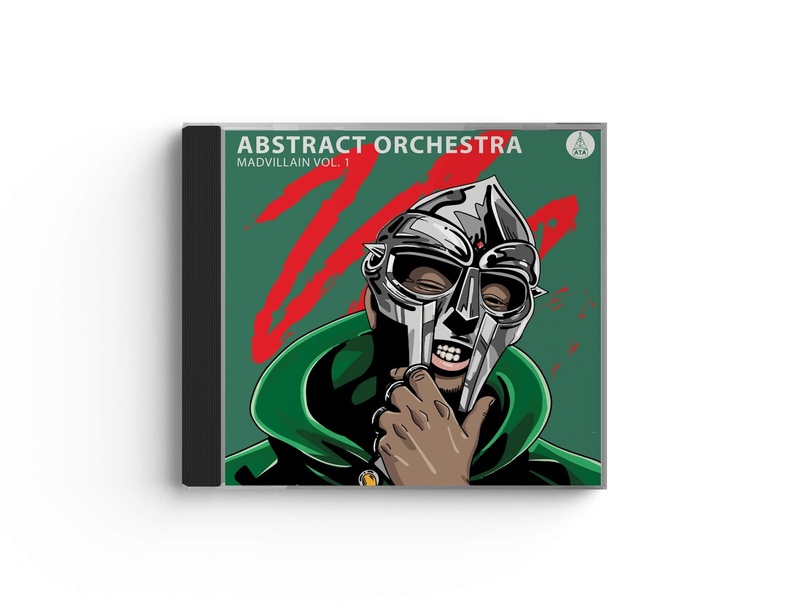 Rob Mitchell says of the record: ‘Madvillainy’ is a jazz album as much as it is a hip-hop album and I wanted to explore this reciprocal territory there has always been between jazz and hip-hop. 70’s cop show soundtracks have always captured my interest and imagination, and I discovered so much amazing music through TV themes, Quincy Jones and Lalo Schifrin in particular. They explored sounds that were menacing, angular, dissonant, frantic and yet captivating. Arranging & scoring up Madvillain Vol 1. has allowed me to explore these sounds that I’ve always loved, yet keeping a strong hip-hop identity as the core of its sound.” Stream "Madvillain Vol.1" below.